My sister, Kasey, & me at the first Mustang Football game! My full name is Jade Kathryn Nelson, born & raised in Sioux City, Iowa (or the Dirty Sioux or “Sewer”). I went to East High School where I participated in 7 different activities and athletics. I wanted to continue dance and soccer, and Morningside is where I could do both. I had my 2nd ACL tear which lead me to quit soccer and join the cheer team. I am majoring in Graphic Design and Advertising. 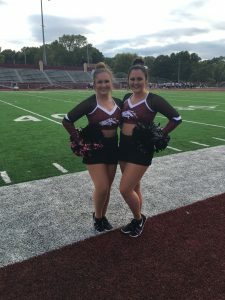 I have one younger sister who is now also at Morningside and joined me on the cheer and dance teams. I will answer to just about any nickname you give me, some of my most used are Kathy or Kathryn.